This unique, dual level property adjoining but separate from the owner's home comes fully loaded. The full kitchen, with river views, includes a fridge/freezer with ice-maker and dishwasher. The living area has a working fireplace and leads to a beautiful sunroom which is bright and airy. The large master bedroom adjoins a TV room with DVD and leads to an office/spare room and bathroom with full washer and dryer. Your comfort comes first in this newly finished property. Views of the river are from the sunroom and the kitchen /dining area. 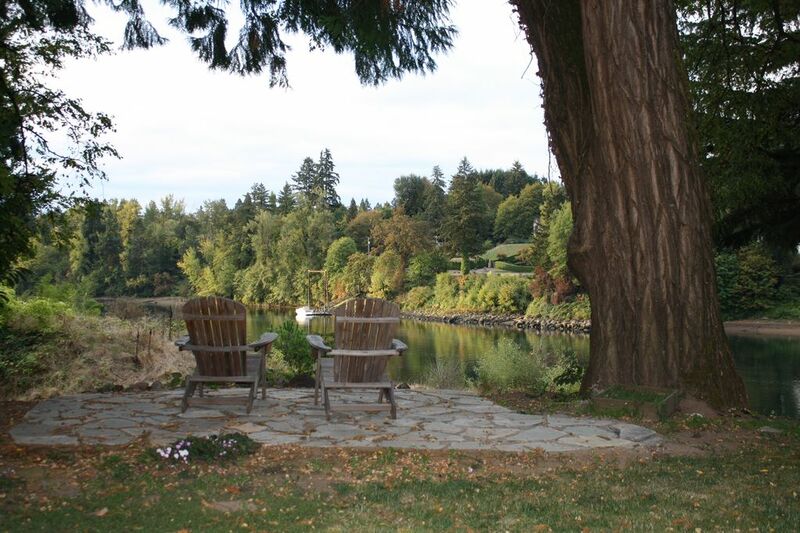 The property is on the Willamette River and has views and access to the river. Off street and close to the private entry. If you’re looking for a tranquil time away that’s serene, so pretty and comfortable with a beautiful view of the Willamette River...this is your place! The picture of the two Adirondack chairs overlooking the river was what drew me in to this HA site in the first place. It will not disappoint! It’s the perfect place to read a book, have a glass of wine, relax and watch the boats go by. All just a few steps away from the gorgeous sunroom with floor to ceiling windows to enjoy the lovely trees, garden area and river views right off the main kitchen and living room that has a very nice cozy fireplace, too. Very well kept and clean. Tastefully decorated. Comfortable bed, lovely bedroom, bathroom. Kitchen was perfect for cooking in which we did most nights because the view was better than most restaurants! The hosts, Will and Gillian, were so nice, friendly and accommodating. Will met us upon arrival to show us around and answer any questions. Gillian checked in on us from time to time to make sure all was well. She shared some of their delicious figs from their garden. We loved the occasional visit from their sweet dogs, Benson and Lulu and cats. We ended up spending more time here than going out on day trips around Portland because it was so relaxing. We highly recommend this place to others! It was perfect! Thank you so much for the lovely review - we sure enjoyed having you stay and hope to see you again sometime. You were the perfect guests. Lovely place - goregous views! We loved the Luxury River Retreat. Gillian was a superb host and very easy to communicate with via text and in person. Our rental was clean, fresh and waiting for our arrival - perfect! This is a beautiful property with river views that cannot be beat!! We loved our stay at this particular property. Gillian and her husband could not have been more gracious. We started every morning with a cup of coffee sitting on the patio watching the river traffic including the wildlife. We highly recommend staying here to anyone wanting something above and beyond the rest!! You won't be disappointed. We loved having Ken and Connie as our guests and sincerely hope that they will return so we can get to know them better. They left the apartment spotless and were thoughtful and gracious. This is a two-level space with ample room, indoors and outside and in a sunroom. The upper floor is sitting/dining/kitchen and the lower floor is divided into a private bedroom and a larger space that is a combined bedroom/sitting room. The riverside location is green and serene, and yet Lyft can have you downtown in 20 minutes. Members of our group found hiking and kayaking nearby, too. Gillian was charming and easy to get along with. Very comfortable and clean with everything you may need. Superb location in beautiful setting right by the Willamette river. The hosts went way beyond the call of duty to make us feel at home. Highly recommended. A Five Star Stay For Sure!!! We have used VRBO for several years now as we look for homes to rent while traveling on our various vacations. This luxury river retreat was just amazing and everything that we hoped it could and should be. Gillian had all details arranged for our check-in. We sent her a text as we got closer to arriving, with her then meeting us and giving us a tour of the home. She asked if we had any questions and then gave us the keys. The river front view was outstanding and just as shown in the property listing's pictures. The amenities truly project and confirm the luxury retreat title. We enjoyed preparing many of our meals at home and sitting at the island enjoying the boats and kayaks and all other river activities happening in front of us. We thank Gillian for being a great and personable host and definitely enjoyed interacting with her two dogs and cats. We loved our stay and the very private, quiet setting of their home on the river. In our eyes, the luxury river retreat deserves a five star rating.